My husband's boss hosts a holiday party each year for his employees. Guests attending must each bring a white elephant gift to exchange. This year we arrived at the party without high expectations for the gifts. After all, the purpose of the exchange is more for entertainment purposes than gain. Last year we took home a signed and framed photo of one of the attendees posed in a karate position and a container of homemade meat rub. Funny gifts, but not exactly something to keep or treasure. Surprisingly this year I wasn't disappointed at all in the gift exchange. I found a gift to fight over and steal! Someone brought a children's picture book to give away titled The Twelve Days of Christmas in Wisconsin. OK, maybe I didn't have to fight too hard considering I was probably the only one there with a huge passion for children's books, but I did make a point to steal it! And, I won't be regifting it next year. Since today, January 5th, is technically the last of of the Twelve Days of Christmas, it's also the perfect time for a little mini review of my white elephant find. 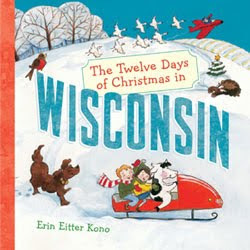 Sterling Children's Books has published a whole series of "Twelve Days of Christmas" books specific to several states, Wisconsin included. Each of the books in the series are written or illustrated by different individuals. The Twelve Days of Christmas, State By State books are currently available for the following locations: Minnesota, California, Florida, Louisiana, New Jersey, New York City, North Carolina, Texas and Virginia. Wondering what my husband brought home from the party? A true white elephant gift. We are guessing it is a cross between E.T. and and dinosaur. Any help in identifying it would be appreciated. I am an Amazon affiliate and may receive a very small commission for products purchased through my Amazon links. Money earned from Amazon is donated to our local library to support area literacy efforts. How fun, and there's a MN version too. Thanks for the tip! 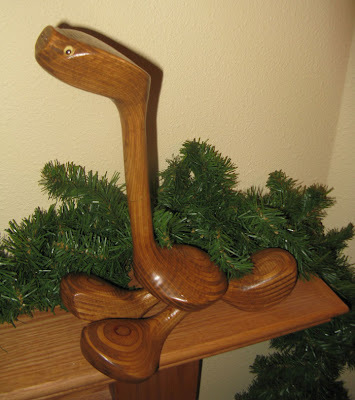 Looks like the putter monster.. maybe he roams golf courses, looking for balls to gobble up! Maybe I need to talk KURT'S boss into having an Xmas gathering, no? They have one for my state (Virginia)! Thanks for the link--I would have gone for the children's book, too! Hmmm...maybe he's a back massager - with his feet and tail...? He sure is cute, though!